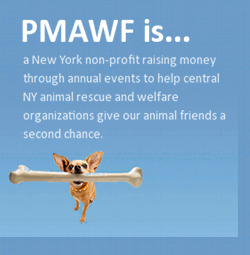 PMAWF is about supporting the organizations and people who enable the unfortunate animals to find their forever homes. We were established in early 2008 in memory of Priscilla Mahar, who always had a fondness for animals. We work closely with those in the community to find and help non-profit organizations that work hard to provide animals second chances for a better life. Through events and donations, PMAWF donates the money they raise to those that need our support. For us, it’s all about the animals and helping them find the lives they should have!